5% of Nasal Mask product buyers choose this product. Continuing in their tradition of mask innovation, ResMed has released the AirFit N30i with Headgear - Starter Pack, a featherlight nasal mask taking comfort and open views to a new level of quality. 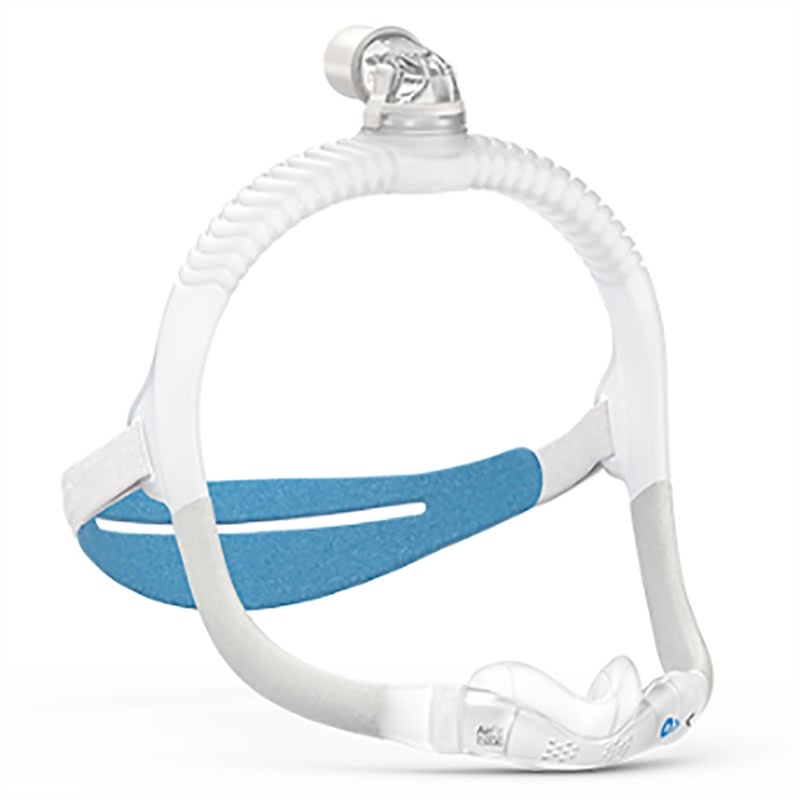 With a 360-degree swivel elbow and a hose connection on the crown of the head, the mask is for anyone who wants to reduce bulk to the front of the face and is great for active sleepers and anyone who may feel claustrophobic. Active sleeper? Get a mask designed for freedom of movement with the ResMed AirFit N30i! Connecting to the tube on the crown of the head, the 360-degree swivel keeps up as you shift into different positions during sleep. By placing the hose connection up and out of the way, it's also great for anyone who may be claustrophobic. For customers looking for a quiet mask, the ResMed N30i is one of the best out there as it checks in at only 24 decibels. This level of noise is considered whisper-quiet and makes it possible to have a full night of sleep without hearing much noise from the mask itself. Finding out what size cushion you'll need is always the hardest part of choosing a new mask. Faces come in different shapes and sizes, and what's right for one person may not work for another. The ResMed AirFit N30i with Headgear - Starter Pack comes with 3 cushion sizes: small, medium, and small wide. 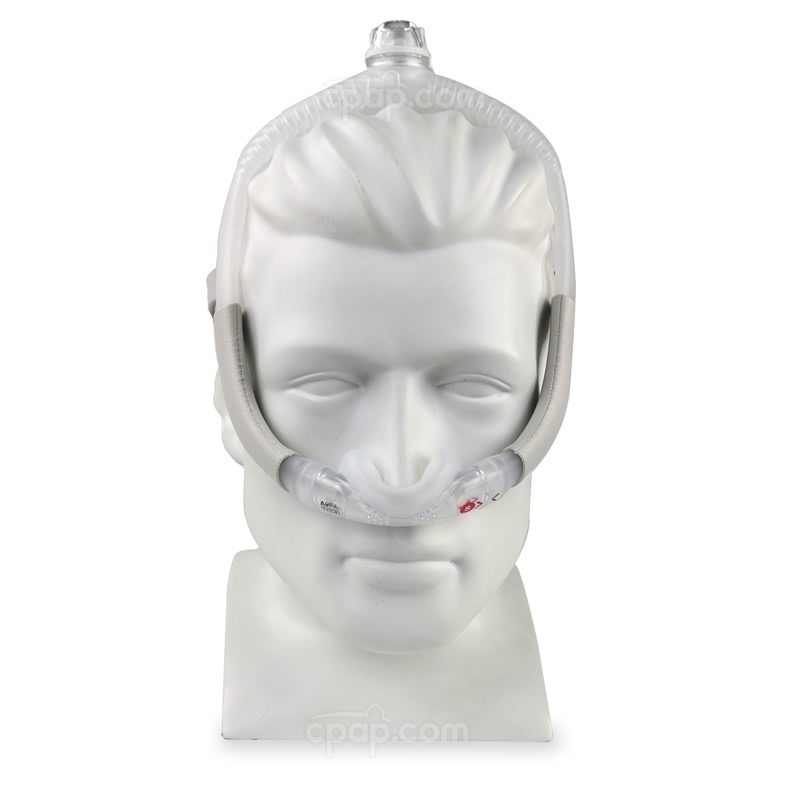 These cushions will fit most faces, making it easier to find the best CPAP mask fit. Looking for a mask with a great seal, without a lot of bulk? Maybe your current mask makes it hard to sleep in a favorite position, or you prefer to read or watch TV before bed? The ResMed AirFit N30i could be the solution you've been looking for. By reducing most of the bulk from the front of the face, the N30i makes it possible to take control of sleep and get back to what's most comfortable. The curved nasal cradle cushion also helps create a world-class seal, flexible enough to move with you as you find a favorite position during sleep. The cushion is rated for high pressure, handling pressure levels up to 25. Command an outstanding view of the widest screens, even when wearing the mask! Never miss a second of a favorite show, book, or text conversation with the ResMed AirFit N30i. It allows for an impressive view, with minimal touchpoints on the face, so you can relax in comfort while falling asleep. As we've mentioned before, the great view may satisfy many people with claustrophobia, possibly helping a person feel more at ease when wearing the mask. 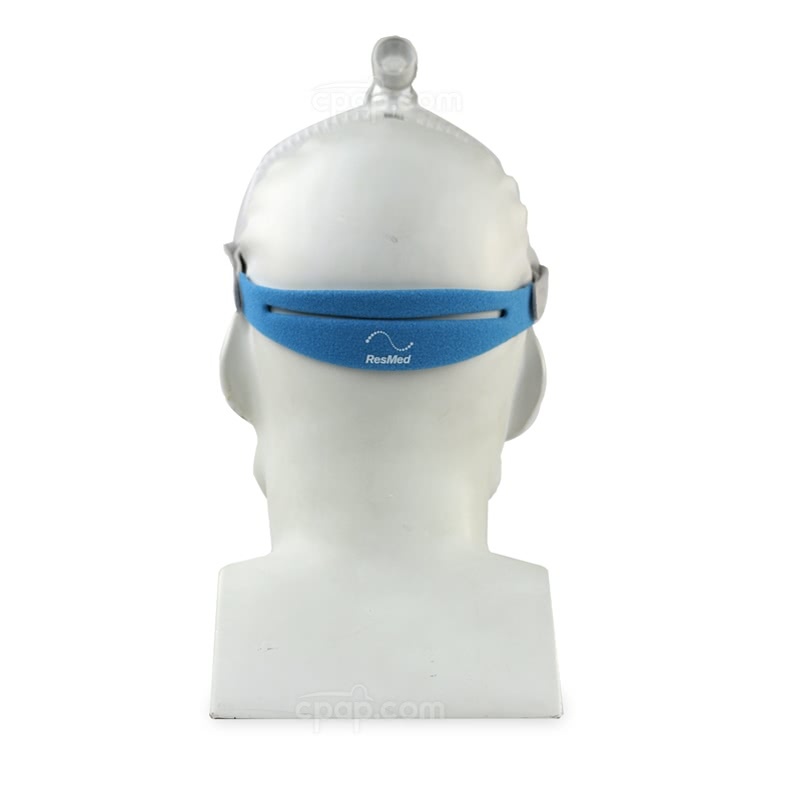 The ResMed AirFit N30i with Headgear - Starter Pack is one of the more minimal designs on the market today, having only 3 parts: the frame (with elbow), cushion, and headgear. 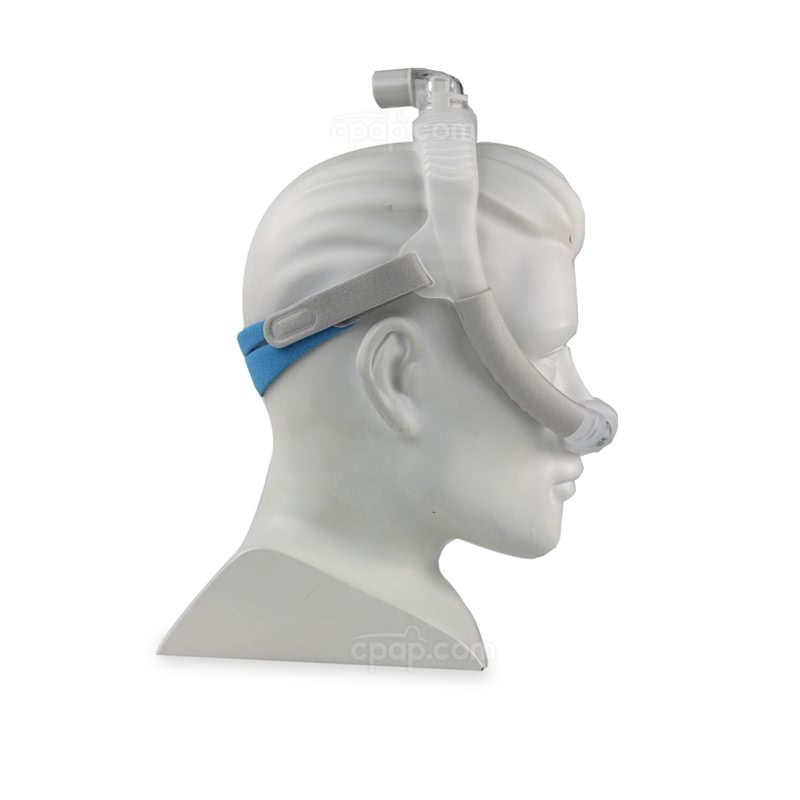 Air from the hose connects at the top of the head and flows through the flexible frame, eliminating the need to use a short tube or other methods to get the air to your nose. The frame is flexible enough to fit a wide range of faces and stretches with the contours of your head for optimal comfort. The minimal pieces help to make it easy to take the mask apart and clean, and the few touchpoints are comfortable and featherlight on the face. The frame comes with soft wraps, so it doesn't have the feel of silicone on the face. With the headgear over the back of the head, begin to position the cushion under the nose adjusting it into place. Once the cushion is roughly in the right place, tighten the headgear straps for a firm fit. If you're having difficulties breathing through the nose, you may need to change cushion sizes to a bigger size. The cushion is made up of a hard plastic backing and a soft silicone pad, resting under the nose. The backing provides structure, and the pad is for comfort. The backing slides into each end of the silicone frame. To remove the cushion, pull the plastic backing out of the silicone frame. There are arrows on the sides of the cushion and the frame, and these arrows should line up next to each other when putting the frame and cushion back together. The Starter Pack comes with 3 sizes of cushions: small, medium, and small wide. Start by disassembling the entire mask. Remove the cushion from the frame, and separate the headgear from the frame as well. Also, detach the elbow from the frame. The headgear is best cleaned by washing in mild soap and water. Be sure to wring out the suds and residue when finished. The soft wraps don't detach from the frame easily, so it may be easier to not try removing them from the frame before cleaning. As the mask frame is hollow, it will need to be submerged in a tank of mild soap and water, so soapy water can pass through the frame. Clean the outside of the soft wraps with mild soap and water. The cushion can be cleaned with mask wipes, removing any debris or deposits from the cushion by hand. Allow all parts to air dry before next use. 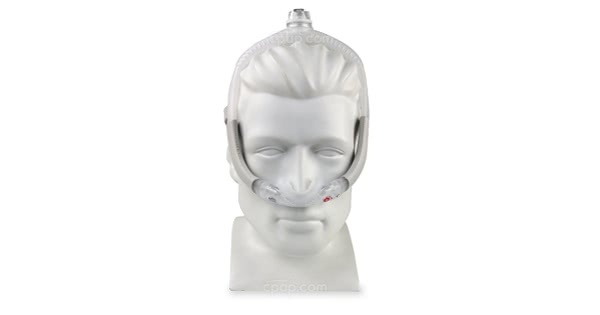 If primarily breathing through the mouth, it's possible to use a nasal mask, if using a device like a chinstrap. The chinstrap works to keep the mouth shut during sleep, forcing someone to breathe through the nose. The ResMed AirFit N30i is one of the quietest CPAP masks on the market today, checking in at a whisper-quiet 24 dBA. For individuals who may be sensitive to noise, the AirFit N30i is a great choice, with very quiet operation.